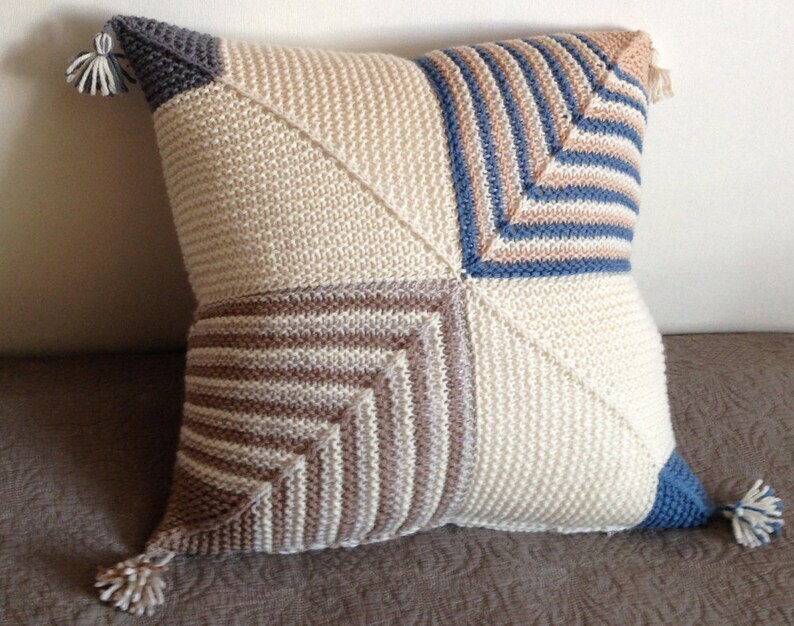 This decorative multi-colour geometric pattern cushion cover will bring cheerfulness to your room. I knitted it by hand using soft and cosy blended yarn from alpaca and wool. It is not lined, finished with a hidden zip along one seam. Please note that I have more matching cushion options available. If other particular colours would go better with your room, please let me know and I will be happy to offer you different options. Fibre content: 65% wool / 35% alpaca. Technology: closure – hidden zip, no lining inside. Size: ca18x18 inch (45x45 cm) but it will perfectly fit 20x20 inch (50x50 cm) as shown in my pictures since fibres are stretchy. Care: hand wash, max 30°C / dry flat. Cushion cover is already washed after knitting. Colour: off white / light brown / blue / grey / beige. Perfect little booties! Thank you so much! Perfect and beautiful little sweater! Can’t wait to take my baby girl home from the hospital in this! Thank you! This. Is. Amazing!!! I can’t believe what an incredibly, well-done, hand-knitted sweater this is. I am amazed at the craftsmanship! Thank you for selling on Etsy! Etsy is proud to have you! Beautiful! Perfect for my new apartment. I might order more in the future. Thank you NerileMakes! I would be happy to accept your payment by PayPal or Etsy Direct Checkout. If, to my greatest regret, you are not satisfied with the product, just let me know and you may return it within 14 days for a full refund not including shipping costs. I ship my “ready to ship” orders within 1-3 working days by standard First Class Mail or First Class Mail International. If you would like to get your purchase faster or tracked, please let me know and I will be happy to adjust the price accordingly. Swedish post office PostNord suggests that delivery within Europe “normally” takes 2-5 working days and it takes 1-2 weeks to be delivered to the US, Canada and Australia. However, I am quite sure that during holiday periods delivery can take longer. Please note that I cannot be held responsible for delayed or destroyed packages by customs officials or possible duty and import taxes. Thank you for taking interest in my creations! I love to draw, I love to knit, I love stained glass and I love colours! If you have any special requirement or idea, please let me know and I would be happy to take your custom order.